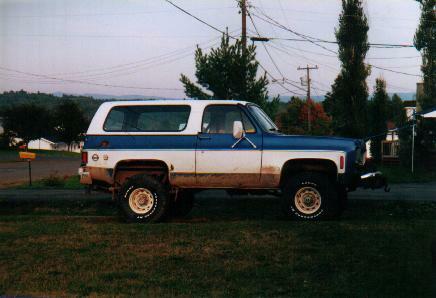 Jason Harding of Plaster Rock, New Brunswick, Canada sent in this picture of his 1973 Blazer. Jason's Blazer sports a 4" lift complete with new urethane bushings, winch, owner built front bumper, rebuilt 4 bolt main 350 with a hotter cam, and rides on a set of 35x12.5x15" tires. Future plans for the New Brunswick Blazer are to replace the body mounts and all of the body panels. Update 9/29/01: The second picture shows the final product. Jason has replaced the body mounts, all body panels, and had the Blazer shot in the original color scheme. Thanks for the pictures Jason. Rob Lough of Grand Rapids, Michigan sent in this shot of his 1978 Scottsdale Stepside. Rob found a great deal when he purchased the 78 from the second owner in 1997 with 37k original miles! The low mileage and incredible condition of the truck are attributed to the previous owner storing the truck and driving it only on summer weekends. Not only is the mileage low, but the body is rust-free and the oak bed is undamaged! Under the hood sits a 305cid, 2bbl, three-on-the-tree power plant that remains all stock except for the sidepipes. Interior amenities are kept to a minimum with power steering, power brakes, AM/FM stereo and a rear sliding window. Thanks for the picture Rob. Eric Garner of North Adams, Massachusetts contributed his 1976 C10 daily driver for the world to see. The Hugger Orange and Olympic White "Big 10" is powered by a 350 with dual exhaust. Eric kept the engine almost stock, and according to him, "It is simple, reliable, and I love it." Eric also wishes to add, "Special thanks to Brad for helping me restore this one. I couldn't have done it without him." Thanks for the fine contribution Eric. Kyle Merrick submitted his 87 Chevy truck. Kyle's truck has air conditioning, tilt, cruise control, power doors, power windows, custom wheels, and 295/50/15 Firestone Firehawk SS20's. On the inside, the 87 entertains its passengers with an Alpine CD player, provides convenience with a keyless entry, and security with an onboard alarm. Thanks for the picture Kyle.